This rural town right off the coast of North Carolina had big plans to build an inclusive playground in the heart of town in memory of a local retired special education teacher, principal, and politician. The community alone contributed nearly $50,000 in donations. Then, Emerald Isle learned that they were one of 30 locations in eastern North Carolina chosen to receive a Play Together Accessible Playground grant from Trillium Health Resources. With the added $225,000, in just under two months, they transformed an empty lot by the local docks into a completely inclusive and sensory-rich destination playground. All of the “coolest” playground equipment is fully accessible and promotes cooperation between kids of all abilities. The Cruise Line™, AeroGlider™, and Unity® RockR all encourage parents, siblings, or fellow playmates to join in on the action together, providing enough space so that any child can transfer on and take a ride. Another key inclusive feature is the double-wide ramps of the main play structure, which enable a better traffic flow for kids with and without mobility devices. A variety of panels along the way provide cognitive and sensory stimulation for everyone. Several other smaller freestanding products around the playground, such as Cozy Cocoon™, Spin Cup, and Moon Rock Climber, provide comfy spots and vestibular stimulation away from the main action. And of course, no inclusive playground is complete without poured-in-place safety surfacing, which allows children, parents, and grandparents alike to access the play area with ease. Not only was this play space designed with inclusion in mind, but with a local flair as well. A vibrant purple and gold color scheme displays their pride for East Carolina University, while high views and telescopes bring the focus back to the beautiful coastline. 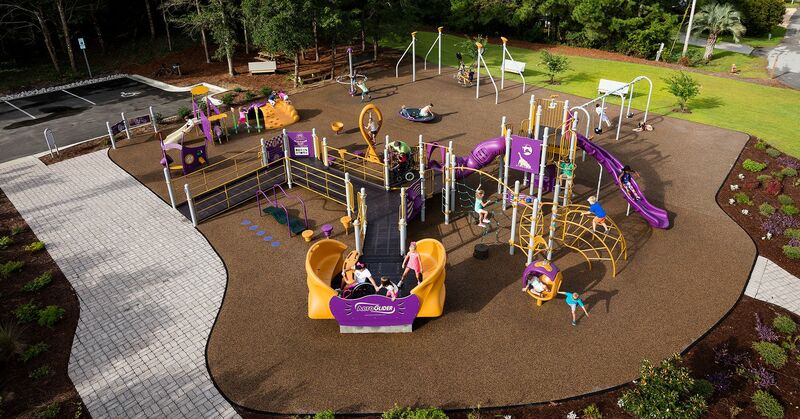 Now Emerald Isle is beaming with pride over this unifying play space, as it brings families and kids together to play side by side and leave differences behind.